Radnor Gardens were formed out of a number of riverside properties but take their name from Radnor House which, until its destruction by a bomb in September 1940, occupied some of the roadside frontage of the gardens. Radnor House was itself named after John Robartes, 4th Earl of Radnor who lived in the house from 1722 until his death in 1757. The house and land was bought by the Urban District Council in 1902. A further property, to the south formed the garden of Cross Deep House, which, until 1906, stood on the opposite side of the road Cross Deep. The northern end of the gardens are formed from the land of Cross Deep Hall built by Samuel Scott in 1758, Joseph Hickey's house built at the same time, Thomas Hudson's house built in about 1750 and demolished in 1808 and later replaced by a Victorian house first named Pope's Garden (later Beechcroft) built in 1864 and a section of the villa built by Baroness Howe in 1808 later called River Deep. These properties were further badly damaged by a flying bomb (V1) in 1944 which destroyed the Popes Grotto public house across the road and were later demolished. River view in front of Radnor House drawn by J H Muntz and engraved by John Green in 1756.
buildings can be seen on Peter Tillemans' view of Twickenham painted in about 1725. This view also shows John Robartes' Cold Bath at the water's edge. A remnant of this building, moved to its present position in about 1847 stands in the gardens today. 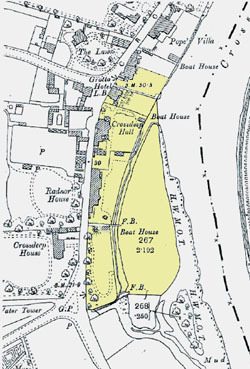 In 1903, 7000 cubic yards of excavated material from the construction of Teddington Lock were used to raise the level of the Ait above the flooding level. When the gardens were officially opened in 1903 a tree, Catalpa Speciosa (Bean Tree) was planted in commemoration of the event. Nearby, in 1911 a Cedar tree was planted celebrating the coronation of King George V. Sadly, the Catalpa was mindlessly cut down a few years ago, but is endeavouring to regrow. The original boundary between Radnor House and Cross Deep House is marked by the central entrance to the gardens and a wall, against which stands the 'Gothick' Summerhouse. This building can be seen on the river view drawn by J H Muntz and engraved by John Green in 1756. 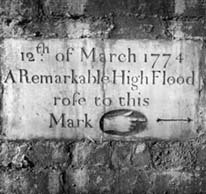 "A Remarkable High Flood rose to this Mark on 12 March 1774". A pointing hand gives the exact level. It is one of a number of similar stones erected at the time along the river; there is another on the wall of the garden of St Mary's Church opposite The Twickenham Museum. Tradition holds that the flood was caused by the bursting of the banks of the lake at Virginia Water, but doubt has been expressed about this.There had been a flood in 1768 when the retaining bank of the lake burst, due to faulty construction - there may have been conflation of the to events. The bowls club was formed in 1920 and in the following year the War Memorial was erected. Although the statue is facing south it was sited to mark the end of a vista from the north-east where the Star and Garter Home for disabled soldiers and sailors stands on the crest of Richmond Hill. Until 1965 the gardens were divided by a stream, effectively a parallel creek of the River Thames and a bridge led on to an island. The stream had become silted up and it was filled in order to unify the whole space. The bridge was actually left in place and the top of its structure can still be seen marking the edge of the footpath leading down from the entrance to the gardens.